Orlando, FL (March 17, 2015): David Weekley Homes was recently honored with a first place award for product design during the 2015 Parade of Homes from the Home Builders Association of Lake-Sumter. The Ryliewood, the model home in Weekley’s Johns Lake Landing community, won first place for the $350,000 to $380,000 price range. Featured in the builder’s Cottage Series collection, The Ryliewood includes three bedrooms and two full baths within 2,000 square feet of living space. The award-winning home highlights the best of David Weekley Homes’ unique offerings, including their signature large kitchen islands and open-concept floor plan. Prices for homes in Johns Lake Landing Cottage Series start from the $255s for a variety of one- and two-story floor plans ranging in size from 2,000 to 3,000 square feet. Manor Series homes start from the $335s and include one- and two-story homes from 2,700 to 4,000 square feet. Residents in Johns Lake Landing enjoy access to community amenities such as playground and recreation areas, a pool with cabana, and nearby shopping, dining and entertainment. Johns Lake Landing is located with easy access to SR 429, SR 50, the Florida Turnpike and Walt Disney World Resort. 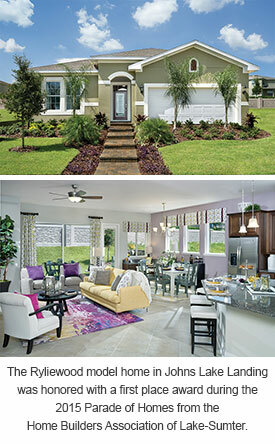 For more information about John’s Lake Landing, please contact a Sales Consultant at 407-865-8283.